Pyramyd Airsoft Blog: An Assessment of the VFC HK416 CQB Gearbox & Internal Parts. Plus some upgrading/tuning tips. Yodel. An Assessment of the VFC HK416 CQB Gearbox & Internal Parts. Plus some upgrading/tuning tips. Yodel. VFC HK416 CQB exploratory surgery. So we made it! We have reached the VFC HK416 CQB's coveted gearbox and my, what a lovely gearbox it is. I've managed to loosen all the screws, save one (on the gearbox, not in my head, smarty). 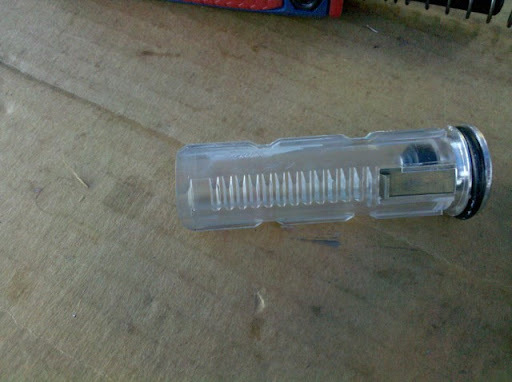 In fact, it's the very one that I'm using my favorite screw-driver to point to. I'm pointing to this screw so that you are aware of it and do not try to ignore it when attempting to open the gearbox. You'll need to unscrew and remove the spring-loaded bolt release lever/plate thing. Once you've done this, you can then get to the final gearbox screw and loosen it. So do it, cuz we about to void some warranties up in this bizzle! Feels good, doesn't it? The first hit is free. Take a minute to look around. See anything you like? 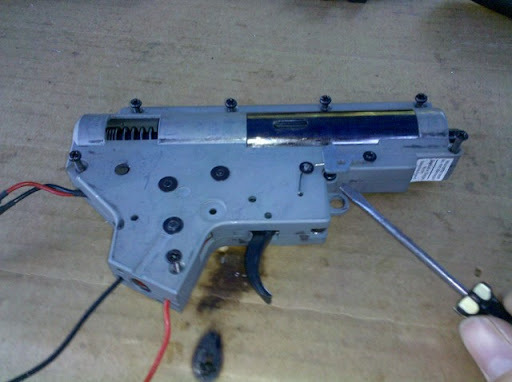 Anything that looks a bit different than what you might expect in a typical version 2 AEG gearbox? 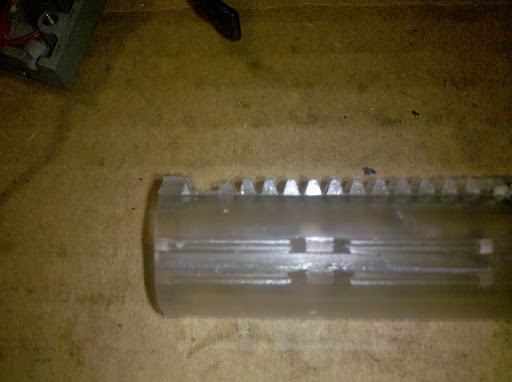 How about those spring-shim things on the spur and sector gear, for starters? I had heard a rumor from one of my Airsoft homies that VFC did this, but to see it with my own eyes was magical. 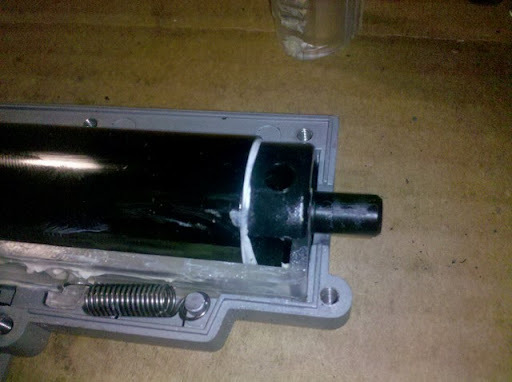 Two items not visible in this pic are the spring guide and piston head, both of which come with bearings to alleviate torque tension on the spring. 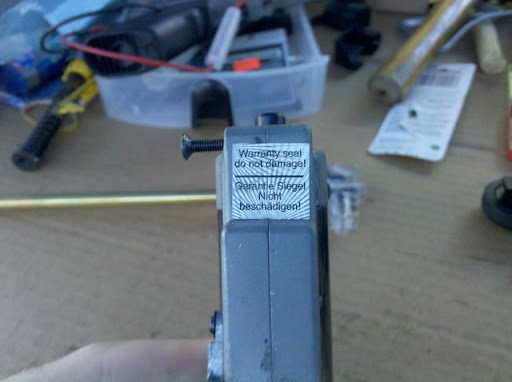 Most stock Airsoft AEGs do not come with either, and VFC has generously gone ahead and included both. Aftermarket versions of the spring guide and piston head with bearing usually go for about $12-20 each. Notice also, that the piston head is aluminum, not plastic. Aluminum piston heads have their advantages and disadvantages. The advantage being that they can obviously take a beating without really sustaining any real wear and tear, but the disadvantage is that they are heavier than a polycarb piston head. The added weight to the piston can be a factor in reducing your FPS. Not sure by how much, but trust me, it'll probably drop a bit. It's science. Although, that reminds me. Perhaps I should test that theory in a future blog installment. Time will tell. We'll see how well you play your cards before I make any big promises. Another thing that I liked about the piston itself was they VFC removed the 2nd tooth, altogether, as you can see from the extended gap between the larger 1st tooth and what is technically the 2nd tooth of this particular piston. Normally, there is an extra tooth in that gap. If the piston I'm using doesn't already come like this, I usually bust out my amazing Dremel 4000 and grind that behatch down to eliminate the chance of any of the sector gear teeth from prematurely engaging (easy now) the piston whilst it cycles during operation. And actually, I take half of the third tooth, which in this case is the 2nd tooth, off as well. I'll get into that later. Why do I take half off that other tooth? Because I like to horse around with the Angle of Engagement (AOE). If you're wondering what the falcon the AOE is, then you're in luck because I'm going to tell you. Right now. It's the angle at which the first tooth of the sector gear engages, or initiates contact, with the first tooth of the piston. Ideally, you want the 1st sector tooth to be straight up and down by the time it hits the first piston tooth, or in other words, you want the 1st sector tooth to be perpendicular with the piston when it starts to pull the piston back at the start of a cycle. I accomplish this by installing what is essentially a foam pad (some of you may be familiar with or have experience with Sorbo pads) that is "super-approximately" (that's just below a "wild guess") a half a centimeter in thickness to the cylinder head. In more or less words, the piston is now not able to travel into the cylinder as far, leaving more of its back end sticking out of the cylinder, and allowing the first sector gear tooth more time to get perpendicular with the piston before it makes contact with the first piston tooth. It would be a lot easier to illustrate this in a picture, but I was dumb and didn't take any while I had the gearbox open. So just use your imagination and consider whatever you come up with in your mind as the correct illustration on what I'm talking about. Everybody wins. Everybody is special and deserves a trophy. Ouch. That last sentence was painful to say. So here, you can see that I've gone ahead and wrapped the rubber o-ring of the cylinder head with some Teflon tape. 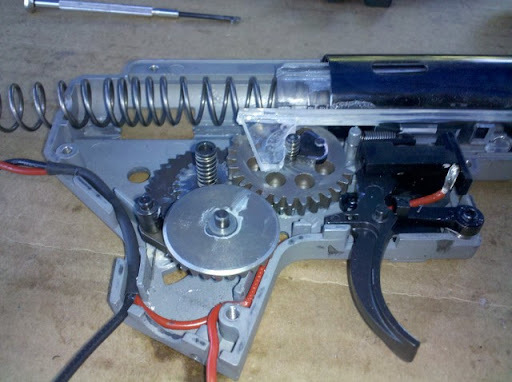 Teflon tape is perhaps one of the most inexpensive, yet effective modifications you can do to improve your Airsoft gun's performance. The whole role of it is like 99 cents at any hardware store. So when you take into account that you are only using a very small percentage of that 99 cent roll to apply a few wraps around the cylinder head, you're talking a few pennies and a fraction to boost your cylinder compression, which affects power, consistency and accuracy. It's a biggie (Notorious!). I'm going to dive into compression a little bit more later. For now, I will tell you that things are progressing quite nicely on this project. We should have a very nice little set up once this thing is finished. Airsoft, which is another why of saying, you're welcome.